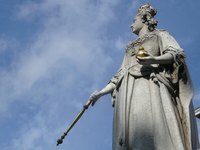 One of the three components of crown jewels in the European tradition, a scepter rod is a symbol of royal power and wealth. A jeweled scepter is also an important component of theatrical or Halloween costumes, as well as children's play that involves kings, queens, princes and princesses. Create your own inexpensive, yet extravagant-looking scepter using common craft supplies and costume jewelry pieces. Attach the glass or plastic sphere to the end of the PVC pipe using epoxy. Apply the epoxy generously to the edge of the pipe. Glue by placing the pipe over the sphere and pressing down rather than the other way around. Hold the pipe in place until the epoxy sets. Let cure fully before continuing. Wrap the four pieces of jewelry wire around the end of the pipe, just below the sphere, to form arms that wrap up and around the sphere. Tightly wrap the end of each wire length once around the pipe, then bend outward. Repeat with the other three wires, spacing them so that the ends stick out at evenly spaced points around the circle of the pipe and the sphere. Apply a few dots of epoxy to the wire coils where they touch the pipe to secure them in place. Bead the wire arms. Fill them with crystal or pearlescent beads, filling the arms almost to the tip. Leave just enough wire at each end to bend it into a small twist using the needle-nosed pliers, securing the beads in place. Wrap the beaded arms around the sphere. Secure them to the sphere with a dot of epoxy at the end of each arm. Glue the marble to the opposite end of the dowel. Do this in the same way you attached the large sphere. Wrap the rope around the length of the scepter to form a spiral. Coil the end of the rope at the end of the PVC pipe where the marble is glued. Use tacky glue to secure the rope in place. Coil it once around the base of the pipe, then wrap up the length of the pipe to the top. Wrap around the pipe as frequently as you want to shape the coils of the spiral as close to each other as you like. Wrap the rope once around the pipe at the top of the scepter, below the large sphere, and glue. Apply glue along the coiling length of the rope on the pipe as well, applying it beneath the rope. Glue rhinestone cabochon to the rope loops on the scepter below the large sphere and above the marble. Use craft glue. Apply masking tape to all parts of the scepter you don't want painted. Tear tiny strips and patches of tape to cover the rhinestones and marble. Wrap the large sphere and its bead arms in newspaper and masking tape. Spray-paint the scepter with silver paint. Spray one side, let it dry fully, then turn it over to spray the other side. Let dry. Remove the masking tape and newspaper.